We love to travel as a family. However, there’s always that one point in a trip where I wonder why I am voluntarily subjecting myself to this insanity. On a recent trip to Costa Rica, we got completely lost trying to find the rental car return. With the very real possibility of a missed flight looming, my husband was completely LOSING IT in the driver’s seat (yes, there were words no child should hear) and our three kids (ages 2, 5 and 8) were screaming and fighting in the backseat. To survive those last three hours, I had to review in my head all the reasons I am passionate about exploring new places with my little monsters. Sometimes travel is not about bonding with you. Sometimes it’s about bonding with an interesting frog. Only two-thirds of my kids are in elementary school, and already our family finds itself torn in a million directions: sports, dance, church, school, play dates…I try to protect our family time, but my goal of dinners together every evening goes out the window during baseball season. What’s a modern family to do? There’s nothing like being away from everyone you know to force your kids to see their siblings and parents as their main playmates — and friends for life. My kids are far better behaved on vacation than at home. They play nicer with their brothers, and they are much more cooperative. Admittedly, in a tropical climate, there is the very real threat of deadly and/or painful creature bites/stings, so they are more reliant on us than usual to keep them alive. People across this big, beautiful earth speak different languages, eat different foods, wear different clothes, have different beliefs…and that’s great. If you live in a diverse city, your kids might be exposed to diversity all the time, but mine aren’t. Traveling with them helps teach them that the world doesn’t revolve around minivans and chicken nuggets. 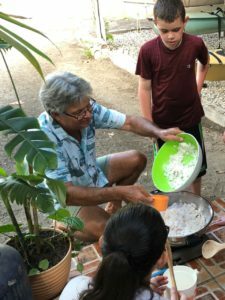 One of our best memories from a recent trip was our kids learning to make coconut candy, a Costa Rican tradition for Easter. Our Tico friends at Aventuras Tropicales offered to teach them, and, to be honest, I was a little worried about how it would go. Kids ages 5-8 can be unpredictable. And sometimes unpredictable means they can be total jerks. But it went great! They loved it — and eagerly tried the final product. Nobody said “ewwwww” (usually one, if not all three, break out into a chorus of “ewwww”). Coconut candy proved to be one of the absolute highlights of our trip. Making coconut candy turned out to be a hit! I have one child who is famously inflexible and routine-oriented. Somewhat surprisingly, he did really well on this trip with very few meltdowns. If you’re afraid to travel because your kid hates change, don’t be afraid to try. My kids tried new foods (“tried” and not always “liked”). They were compelled to contend with frequent and sudden changes in scheduling. That’s right, kiddos. The world doesn’t always revolve around your baseball games. We had an Easter absent of our usual traditions, and, rather than the revolt I was expecting, they bragged about it to their friends! They made new friends from all over the world; the language of playgrounds is universal. Disclaimer: I said “very few” and not “no” meltdowns (We had two major ones on our last trip). I make no guarantees about the outcome of traveling with a routine-driven kid! Random adventures may be my favorite part of traveling — the chance to see the world through new eyes, and teach the kids that life really can be almost as exciting as an iPad app. Did you just pass two roadside stands selling arroz con leche (rice pudding) two blocks apart? Back up and taste test! 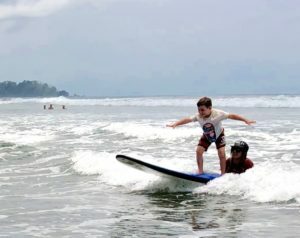 Maybe you’ve got an expert surfer on your hands and you’ll never know it unless you travel! Unless you live at the beach, in which case, this reason to travel is not for you. Don’t tell the kids, because you know they don’t want to learn anything, but my 8-year-old gave a whole presentation to his class on tropical creatures when we came home. 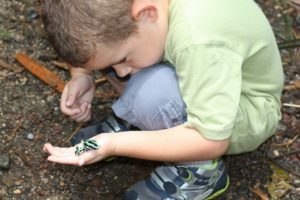 Wherever you go — museums in Europe, U.S. national parks, tropical rainforests — your kids will learn more in a day than they would a week at home. And so do the grown ups. I never knew there were so many species of ants. I mean, I knew, but I hadn’t experienced them. And, really, it’s okay if I don’t experience them again anytime soon. Did you notice what I left out? There was very little relaxation on this recent vacation, but we all had a great time, and are already planning our next adventure. So here’s my best advice when traveling with little monsters: keep your expectations low. Did you manage to talk your 8-year-old out of hiding his pocket knife in his bag and taking it through security? Great! You Win! Did you keep them all from drowning? Fantastic! Who cares if they haven’t washed their hair or eaten a vegetable in two weeks. Did they eat at all? Super. And even if your teenager did insist on bringing a bullet ant (apparently the insect with the most painful bite in the world) back home and you had to endure grilling by customs (that’s a friend’s story to tell…), you all made it home alive. And that’s what counts.